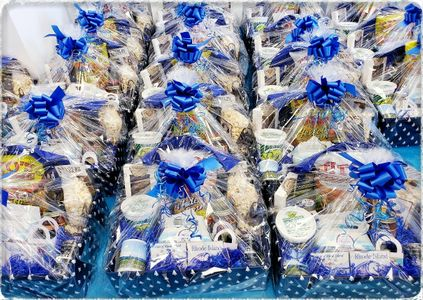 Only In Rhode Island can create the perfect gift or gift basket for corporate VIPs, wedding gift bags, party favors, centerpieces, hospitality appreciation, birthdays, anniversaries, or any other occasion you wish to make truly special. We work with companies such as Hasbro, Textron, Fidelity, CVS, Toray, and so many more - in Rhode Island and beyond - to create the perfect corporate gift-giving experience. And we have been honored to provide favors and hospitality bags to hundreds of weddings, big and small, throughout the Ocean State. We've been doing this for almost 20 years and we're very good at what we do. We make it look easy and we make sure our clients never see the hard work that goes into it. As far as you are concerned, all it takes is a simple conversation or a click of the mouse! Our professionalism and attention to detail will make the transition from your vision to the finished product perfectly seamless. HOW IT WORKS We start with your desired price-point, to ensure that we always work within your budget. Then we determine how to get you the most bang-for-your-buck and put together options (with pictures) for you to choose from. These options can include custom items, such as branded coasters, mugs, etc., and there is no extra charge for design and customization. We can also include custom items of yours, such as hats, sports bottles, etc., and there is no fee for us to add those into the gift design. Once we have your approval, we prepare the baskets per your specifications, then deliver to you or ship to your recipients. And that's all there is to it! Of course, we at Only In Rhode Island are also pleased to offer pre-designed gift baskets, each with a fantastic selection of Rhode Island favorites, if you would prefer to go that route. You can simply order the number of baskets you'd like online, and email us a list of recipient names and addresses. You can include a customized gift message during checkout, and we'll take care of that too! If you need each basket individually shipped, we will provide you with shipping and tracking info on each one. It's really that easy! With the most unique products in the Ocean State, Only In Rhode Island is the ideal source for all your gift-giving needs. Our innovative selection offers a range of options that are perfect for family, friends, employees, business associates, or anyone to whom you'd like to show your appreciation, affection, or admiration. We are very proud of the locally created products we offer and we would be delighted to work with you.